The Capital Unit of the Mohawk Council of Kahnawà:ke would like to inform the community of the upcoming project to replace the water & sewer lines in the Pentecostal Church area. Work is scheduled to start on Tuesday, May 23rd and continue until mid December 2017. This project will include replacing the waterline & sanitary sewer system. 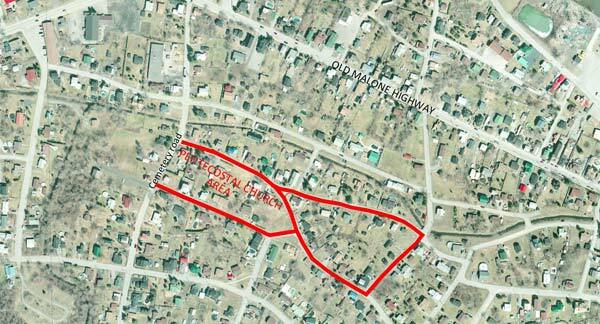 Upon completion, the road will be resurfaced with new asphalt (see map below). Residents in the area may be inconvenienced with temporary loss of water, dust and noise from trucks and equipment, detours and temporary road closures. Proper road signalization will be installed to warn of the construction limits. The community will also be notified when a road closure is scheduled. All private properties that are affected by the work in this area (driveways, walkways, hedges and/or fences) will be repaired or replaced prior to the completion of the project. Please contact the Technical Services Office at 450-635-1016 if further information is required.